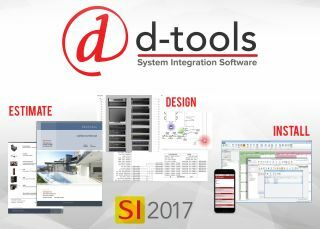 The What: D-Tools will demonstrate new enhancements and features to the company’s on-premises System Integrator 2018 (SI 2018) solution—what it calls "the most widely used and comprehensive estimation and budgeting, design, and project management software in the world"—at ISE 2019 in Stand 1-N80. The What Else: Specifically designed to fulfill the diverse needs of systems design and installation firms, SI 2018 ties project workflow into a singular, data-driven, connected process that improves operational efficiency for increased profitability, according to D-Tools. The Bottom Line: Available for order January 31, 2019, the latest release, SI 2018 R2, offers valuable productivity and pricing enhancements—including Workflow Rules, Calculated Items, and more—to help commercial AV and security companies worldwide streamline business processes. A free 30-day trial of D-Tools can also be downloaded at https://d-tools.com/hosted-free-trial-signup/.